We are so proud of her decision to take upon the name of Christ. at the thrift store for $3. “When was the big day”, you ask? Oh, it’s August 2010; I must be late posting. No, I just took this picture 2 weeks ago. Because I realized that I had forgot. Lucky for me, Sophia is really easy going. And she can’t be mad at me for forgetting. Because she covenanted to be Christ-like. 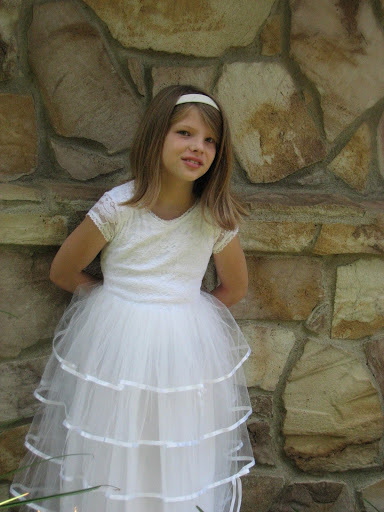 remember child #3’s baptism picture? brain cells with every pregnancy? It’s too bad that Caroline was only 4 months old back then. I may have gotten away with it. Your girls are so beautiful — love these photos and love the dress Sophia picked out. Brain cells are most definitely depleted with each child's birth. I have no doubt in my mind (what's left of it!). You're hiliarious Alice and your girls are just beautiful. I love the dress Sophia picked out!Thrift stores rock. That's awesome. Better late than never? At least the dress still fits her. So pretty! I love Bella's tats. LOL! I think the dress is beautiful and I am so glad you decided to take the photo even though it was late. I love looking at all your girls. 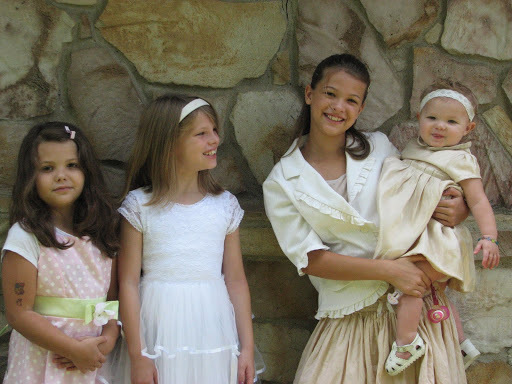 It takes me back to the day when I was one of seven… you just gotta love sisters.